Ramy H. Joudeh is a native of Brooklyn, New York who completed his undergraduate studies at the State University of New York at Buffalo. At SUNY Buffalo, Ramy graduated with a B.A. in political science and was a member of the Student Association. During his undergraduate studies, he completed an internship with the Kings County District Attorney’s Office. Ramy continued his studies at the Touro College Jacob D. Fuchsberg Law Center, where he received his JD. While a law student, he held an externship with the Nassau County District Attorney’s Office as well as an externship to help victims whose homes were destroyed by Hurricane Sandy recover funds from insurance companies. 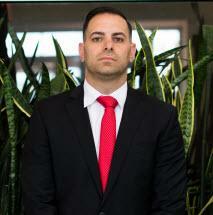 Ramy began his career as an Assistant District Attorney for the Kings County District Attorney’s Office. During this time he refined his skills as a trial attorney where he successfully prosecuted numerous cases. After many successful trials as an ADA, Ramy H. Joudeh joined the team at Chopra & Nocerino. In this role, Ramy is able to fulfill his true legal passion of helping victims of accidents recover damages for their injuries so they can focus on the road to recovery. As a litigator, Ramy is in court everyday fighting to help his clients get the best possible outcome.